Junior Michael Houske returned to Paynesville Area High School full-time last week after being injured in a car accident last May and missing three months of school and going part-time for two months. Getting to miss school for three months or only having to attend in the mornings (while napping all afternoon) used to be things about which Michael Houske dreamed. He dreamt about these things until he actually got to do them. Being bedridden for months, he found, is really boring. On Memorial Day last year, Michael was severely injured in a car accident near his home in Willmar, suffering a concussion, six broken ribs, a dislocated and broken pelvis, a punctured lung, a severed urethra, and a scratched liver. He spent four days in the intensive care unit, three weeks in the hospital, and four and a half months of bed rest. He missed three months of school, went partial days for two months (starting three hours per day on Monday, Nov. 28), and started back at PAHS full-time last week. 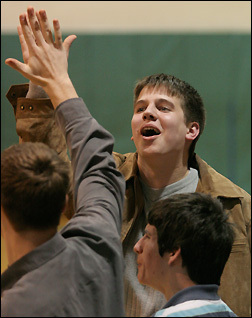 Junior Michael Houske high-fived sophomore Alex Svejkovsky while cheering with sophomore Colin Spooner during a recent PAHS boys' basketball win. After a severe automobile accident last summer, Houske can only cheer for his teammates this year, but he has started back at PAHS full-time, and he hopes to rejoin his teammates on the floor next year. "They say when you're bedridden for an extended period of time it takes four to six days to recover," said his father Rick Houske, a sixth grade teacher at PAMS. Michael was bedridden for four and a half months, meaning at four to six days to fully recover, it should take a year to two to heal completely. When Michael attended school half days in December and January, he would be so tired that Rick would take him to his aunt's Ann Jacklitch's house (Rick's sister) and Michael would sleep the rest of the afternoon, Rick said. Michael still finds full school days "long" and "tiring," but he is glad to be back, he said, though he is still trying to finish his second quarter work. He missed a week of school in January due to illness. In the first quarter, said Rick, "he got some of the best grades he's ever had." Since the accident, Michael has had 11 surgeries over the summer and fall, and he has also battled lingering infections. Sometimes last summer, said Rick, Michael would shake the hospital bed at their home from his fever spasms. He also lost 42 pounds over the course of his injuries and recovery. He had his last surgery and his last staph infection in November. "About two weeks ago is when he really started to perk up," said Rick. Teachers, added Rick, "have bent over backwards" to help Michael. In addition to tutoring with teacher Michelle Andersen, Michael has been working out in fitness center with Community Education director Matt Dickhausen to regain his strength. It's awesome having his friend back in school, said ninth grader Jamison Wall, a basketball teammate. Last Memorial Day, about a mile away from home in Willmar, Mike was riding in the passenger seat of a car that was struck while crossing an intersection. The other car T-boned the car Michael was in, striking between the doors on the passenger side. The impact of the accident forced Michael's seat to compact to 12 inches and caused the injuries to his right side. His pelvis, for instance, twisted and broke to squeeze into that 12-inch seat. "I heard all the sirens and stood by the window thinking it was some bust," said Rick, who was home when Michael suffered his accident. It took an hour for Michael to be cut from the car and then he was airlifted to a Twin Cities hospital. "He was fortunate it was a mid-sized car," said Rick. If it had been a truck or SUV, it would have hit him higher, Rick was told, which could have done more damage, or even have killed him. "It could have been a lot worse," said Rick. Michael got hurt just days after the last day of school and just in time to spend the summer in bed, instead of going to horse shows and playing basketball. "I have pretty good timing," he joked. "The thing that has been remarkable about all of this," said Rick, "has been his attitude. He never was angry or down about it." The driver of the car that struck Michael visited numerous times over the summer, said Rick, and Michael never expressed any blame. Getting cards from opposing coaches and players and visits from teammates and friends really helped to keep Michael's spirits up, added Rick, who estimated that they had more than 1,000 visitors over the summer. Friends and teammates coming to play cards or visit - he could sit up for short stretches - helped relieve the boredom of being bedridden, said Michael. Over the Christmas break, Trevor Fleck, a 1987 PHS grad and now a producer for Fox Sports North, invited Michael and Rick to a Timberwolves game, where they got to see how the television production of an NBA game works. Last summer, said Rick, Fleck sent three autographed baseballs - from Twins Bert Blyleven, Kent Hrbek, and Jacque Jones - which arrived during a particularly bad bout and really lifted Michael's spirits. Now, though, they hope the worst is behind him and that he continues to recover. And that there will be no long-term effects to his health. Actually, one of the hardest things for Michael these days is watching his teammates play basketball from the stands. He has attended all but two games this year, even though it drives him nuts to watch from the stands, he said. Watching them win, such as their recent high-scoring game against Minnewaska, is fun, said Michael. "He's always cheering for us," said junior teammate Cory Nietfeld. "I hope to play basketball next year," said Michael. He should be physically able, said Rick; he just needs to recover his strength and endurance. Michael may attend some track practices this spring depending on how he feels. After high school, he plays to attend college and become either a sports broadcaster or teacher/coach.